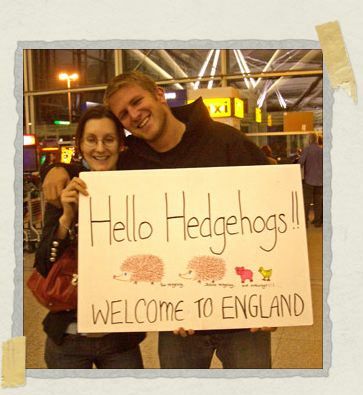 Hedgehogs Without Borders: Welcome to England! Two of the most important things that Tim and I have learned to abide by on this trip (in addition to being flexible) is to (1) always listen to our instincts, and (2) to not be afraid to question assumptions. After six months in South America and three weeks in Spain, a fortnight in the birthplace of the English language was a welcome change. What we hadn't realized was how difficult the adjustment would be. Saying things like gracias and disculpe instead of "thank you" and "sorry" had become so instinctive that it would take weeks to get out of the habit. And when the customs lady started hassling us (well me, actually, but only in fun), we both found ourselves unable to grasp the fact that we were just speaking English to her: we sort of kept translating everything she said from English to English in our heads, which probably made us come across to her as a little thick. But yes, we were looking forward to this break, this little vacation within our trip. Two weeks of staying with family and friends. For the first time in almost seven months we could get off of our plane and wander into the airport without having to think. We didn't have to rifle through a Lonely Planet guide trying to figure out how to get downtown from the airport, or trying to work out which hostels to have a look at first. We could wait for someone to take us by the hand and say "come this way." Which brings us to Sophie and Michael. We'd first met them in Huacachina, Peru, when the power in our hostel went out for hours and hours. We all wound up sitting around out by the bar, having a few beers by the light of a few candles, and getting to know each other. The next night we were laying in our room reading when we heard Sophie wandering around the hostel calling our names. The two of them were going out to dinner with a dozen other people, and wanted us to come too. Not knowing which room was ours, she had just started searching the hostel for us. Little things mean a lot when you're thousands of miles from home, and that effort to keep us from feeling left out just meant the world to us. We'd met again in Cuzco, Peru, and gone out to dinner the night before the two of them were due to start the Inca Trail. (Michael and I were physically attacked by a pair of violent ten-year-olds, but that's a story for another time.) That night, they told us that they wanted to pick us up from the airport when we got to England. We joked that we wanted them to wait for us holding a sign. Look at the sign in that photo. Is that not the most adorable thing you've ever seen? Sophie's parents were moving, and together we all spent what was in fact the final night in her old house. All the furniture had been moved out of it already, but we were awarded her parent's old room and the most comfortable inflatable bed in the history of the world. We sat up together having a few beers, telling stories and reminiscing, and then we all retired for the night. There's a kind of sleep you get at home that you don't really get on the road. It's the kind of sleep you get when you visit your parents, maybe, but not if you're just staying over with friends. A feeling of total contentment, of peace, of being warm and comfy and safe. The kind of sleep you can only get when you feel completely at home. That's the kind of sleep Jessica and I got that night. The next morning, we awoke to the smell of bacon frying. Mike, a caterer by trade, was cooking us a traditional English breakfast: eggs, bacon, sausages, beans, and more. 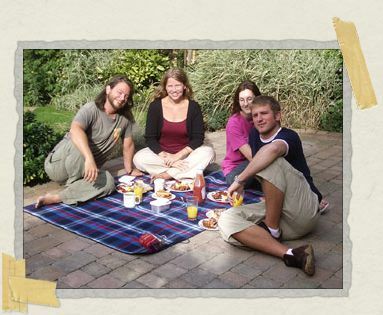 Because there wasn't any furniture, we set a picnic in the back yard, and feasted like kings. We piled back into Mike's car, and set off through the English countryside. It was lovely: green, rolling hills, often with a church steeple peeking out here or there. Exactly as we'd pictured. And despite England's reputation, the weather was beautiful. 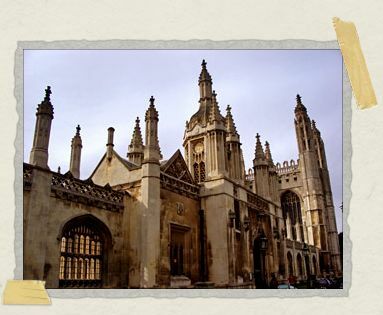 Cambridge was beautiful. We walked among the storied streets, stood alongside the river to watch the "punters" go by on their gondola-esque boats, and tried in vain to find a decent "chippie". (A "chippie" is where you find real fish and chips, we were told.) Soon enough we wound up in an inviting riverside pub, enjoying a nice meal and a pint or two, and trying to get Mike and Sophie to let us pay for something. All too soon it was time to go. They drove us to the rail station and helped us figure out where we had to go to get to my Aunt's house. Then it was hugs and kisses, and a very tearful goodbye. We took the "Hello Hedgehogs!!" sign with us, and sat it next to our bed the entire time we were in England. You guys look like you are having fun and meeting some good people (England folks) and some not so good people (10 year olds that attacked you). Continue having a ball in your travels and I will pray for your safe return to the states. I'm so glad that you two are enjoying yourselves and that the English folk weren't as bad as the silly Americans make them out to be. I hope that you have a lovely time in Turkey and I'll see you whenever you get back to the US. TTFN! that sign really is the most adorable thing ever… next to the hedgehogs themselves. you've got an entourage. i love that sign. home-associated sleep is indeed a wonderful thing. When are you going to update the photo album? And there's the million dollar question! We're working on it, slowly but surely. Putting them in order and captioning them takes a surprising amount of time. But hopefully we can have the rest of South America (and maybe Spain and England too!) up by the middle of November. I have been reading about your travel for a while. It looks like you are having tons of fun and meeting a lot of great people. I just read an article in my 'Budget Travel' magazine and thought the two of you might be interested in the place mentioned. It talked about the city of Olympos in Southern Turkey… that has four 'tree house hostels'… the pics look reall cool and the most expensive is $20 USD a night… so, if you have time I hope you can go there… and if you can't go that's okay too. I wish you the best on your travels to come. Thank you so much, Janet! That was incredibly thoughtful of you to give us those links. We will definitely check them out!